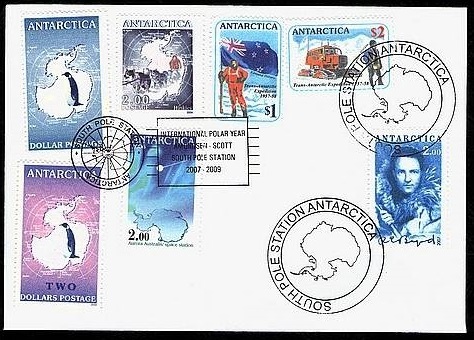 Antarctica Post has issued a new stamp each year since 2002. 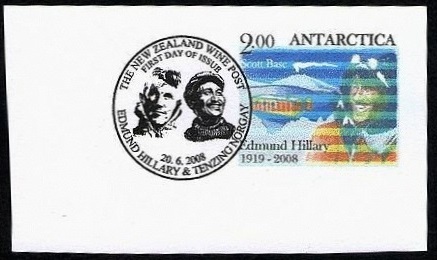 These stamps are designed and issued with the help of New Zealand Wine Post. Their stamps secure special delivery between the USA bases, South Pole Station or McMurdo Station to Antarctica Post Agency in Dunedin. Once the letter reaches New Zealand it is forwarded using other postal services. As well as providing a postal service they also have an eye for the collector market as well. They offer a service where for $10.00 they will provide a letter or postcard cancelled at the South Pole and sent to you via New Zealand. Examples of these can be seen on this page. 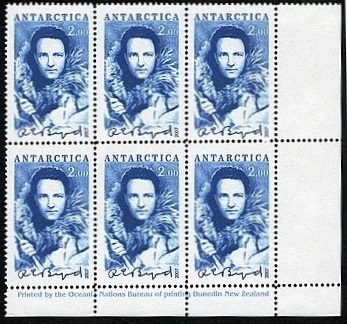 Our collection of Antarctica Post stamps has continued to grow until now the decision has been made to establish the second page. 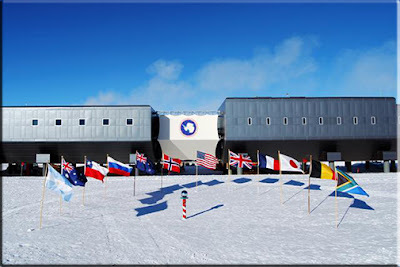 Since The Antarctica Post is a postal service between the South Pole Station to Antarctica Post Agency in Dunedin, first, I think we should take the time to look at the South Pole Station in more detail. 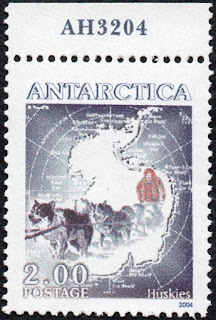 It appears on many of the covers and postcards, it's also shown on some Antarctica Post stamps too. The Amundsen-Scott South Pole Station is a United States base. Although they do not hold any territory in Antarctica, the USA has a base, McMurdo Station, near New Zealand's Scott Base and the base South Pole Station. Both these bases are supported via Christchurch, New Zealand. There have been three polar stations. The original South Pole station, now referred to as "Old Pole", was constructed by an 18-man United States Navy crew during 1956–1957. The crew landed on site in October 1956 and was the first group to winter-over at the South Pole, during 1957. 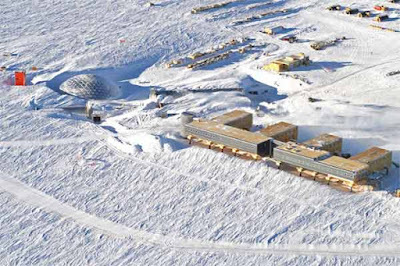 The buildings of Old Pole were assembled from prefabricated components delivered to the South Pole by air and airdropped. They were originally built on the surface, with covered wood-framed walkways connecting the buildings. Although snow accumulation in open areas at the South Pole is approximately 8 in (20 cm) per year, wind-blown snow accumulates much more quickly in the vicinity of raised structures. By 1960, three years after the construction of the station, it had already been buried by 6 ft (1.8 m) of snow. The station was abandoned in 1975 and became deeply buried, with the pressure causing the mostly wooden roof to eventually cave in. 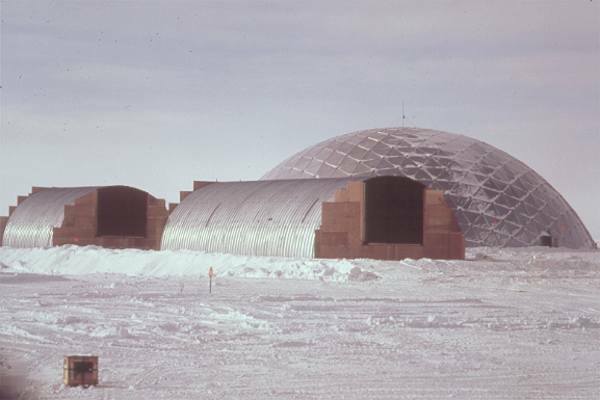 The second South Pole Station - Dome and Arches. The station was relocated and rebuilt in 1975 as a geodesic dome 50 meters (160 feet) wide and 16 meters (52 feet) high, with 14 m × 24 m (46 ft × 79 ft) steel archways, modular buildings, fuel bladders, and equipment. Detached buildings within the dome housed instruments for monitoring the upper and lower atmosphere and for numerous and complex projects in astronomy and astrophysics. During the 1970–1974 summers, the dome construction workers were housed in Korean War tents, or "jamesways". These tents consist of a wooden frame with a raised platform covered by canvas. A double-doored exit is at each end. Although the tents are heated, the heat output is not sufficient to keep them at room temperature during the winter. After several 'jamesways' burned down during the 1976–1977 summer, the construction camp was abandoned and later removed. Over the years various buildings and tents were added to accommodate increasing numbers of seasonal personal spending summer at the base. The dome slowly became buried until eventually much of it was under the ice. It was abandoned in 2008 when the new Elevated Station was ready for use. The dome was removed during the summer of 2010. Above, as of October 2007. The new Elevated Station has been built and the old Dome Station is still to be removed. In 1992, the design of a new station began for a 7,400 m2 (80,000 sq ft), two-story building that cost $150 million. Construction began in 1999, adjacent to the Dome. The new station included a modular design, to accommodate an increasing station population, and an adjustable elevation, in order to prevent the station from being buried in snow. In a location where about 20 centimetres (8 in) of snow accumulates every year without ever thawing, the building's rounded corners and edges help reduce snow drifts. The building faces into the wind with a sloping lower portion of wall angled to increase the wind speed as it flows under the buildings, and passes above the snowpack, causing the snow to be scoured away. This prevents the building from being quickly buried. Wind tunnel tests show that scouring will continue to occur until the snow level reaches the second floor. The building is designed to be raised so it will never become buried like the earlier stations were. Amundsen-Scott South Pole Station, February 2008. In the foreground are the ceremonial South Pole and the flags for the original 12 signatory nations to Antarctic Treaty. Antarctica Post Agency is in Dunedin New Zealand. This is correctly a New Zealand private post. One of many legitimate posts in New Zealand's de-regulated postal services. The mail goes from the Dunedin Agency to the USA Deep Freeze base in Christchurch where it is flown down to the South Pole station. These stamps are used to carry the mail. 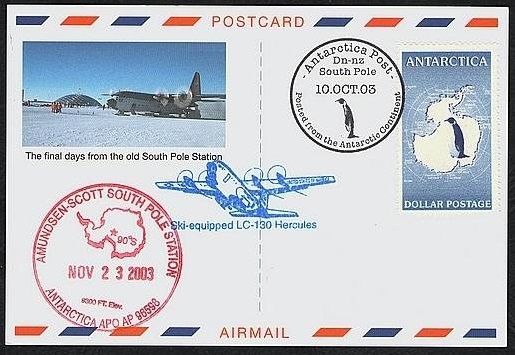 Sometimes the Antarctica Post mail is flown to McMurdo and sometimes both McMurdo and the South Pole Station. Pre 2002 - Forerunner Issue. This is believed to have been one of a series of designs leading to the first Antarctica Post stamp, the blue penguin. 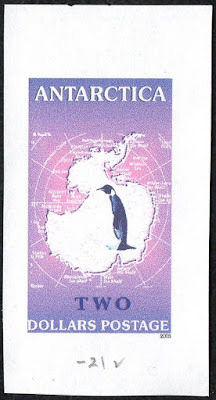 2002 Antarctica Post 2002 trial design and test red overprint. Both the stamp design and the trial overprint were never used. 2002 Blue Map & Penguin. Date of Issue - 5th November 2002. In late 2002 Antarctica Post was ready to issue their first stamp, known today as the '$1 Blue Penguin.' 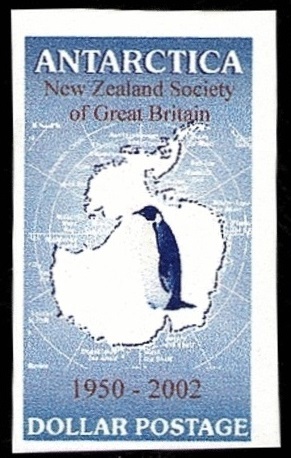 It was a simple, yet very effective design, with a single penguin against the background map of Antarctica. 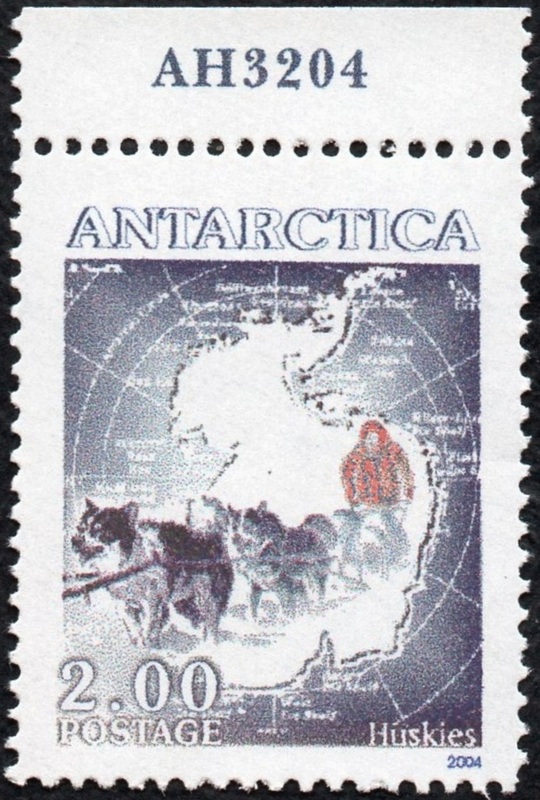 All Antarctica Post stamps can be identified by the word "Antarctica" usually, but not always, placed at the top of each design. 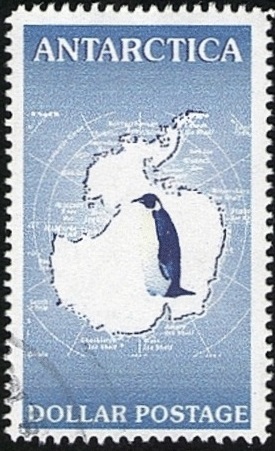 Left-hand: - A map of Antarctica with the Ross Dependency directly in front of the penguin's head. The penguin is an Emperor Penguin. Notice this is a used example being lightly cancelled in the bottom-left corner. 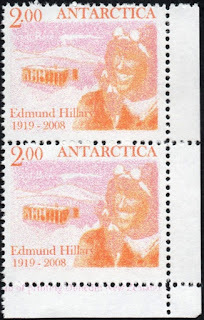 Right-hand:- 2002 Antarctica Post first issue. 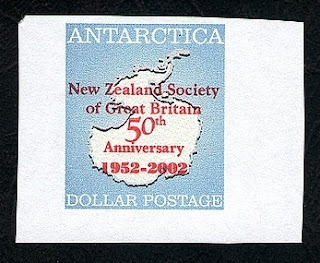 New Zealand Society of Great Britain 50th Anniversary red overprint. Imperforated on gummed paper. 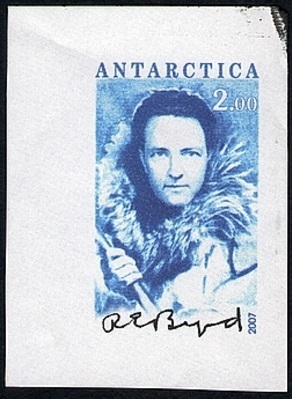 A First Day Post Card showing a $1.00 Blue Penguin cancelled with an Antarctica Post 'First Day of Issue' cancel. 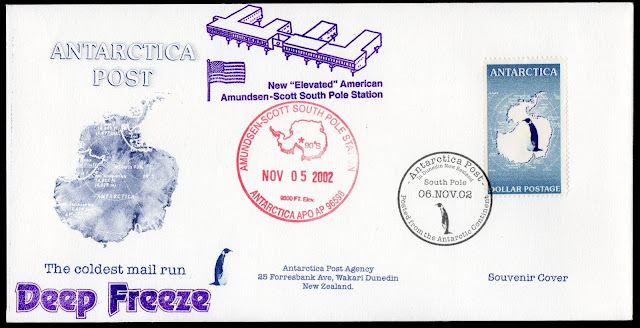 On the left side, the cancel of the Amundsen-Scott South Pole Station applied for the return flight to New Zealand. The reverse side of the card can be seen below. 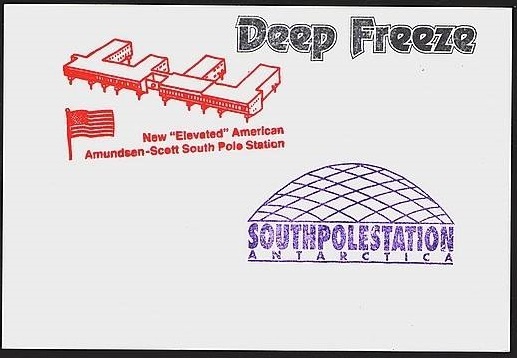 The second 'Dome' South Pole Station is shown in the picture while a drawing of the third 'Elevated' South Pole Station is shown on the back. 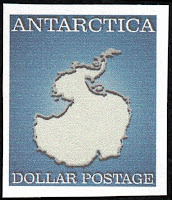 Antarctica Post postcard 2003 with Blue Penguin Dollar Postage stamp. Posted from the Antarctica Post Agency in Dunedin on Oct 10, 2003. Posted back to Dunedin from the South Pole Station via Air transport November 23. Now, this is close to the date that the 2003 $2 Purple Penguin was issued so it's likely this was the last date the Blue Penguin was used. 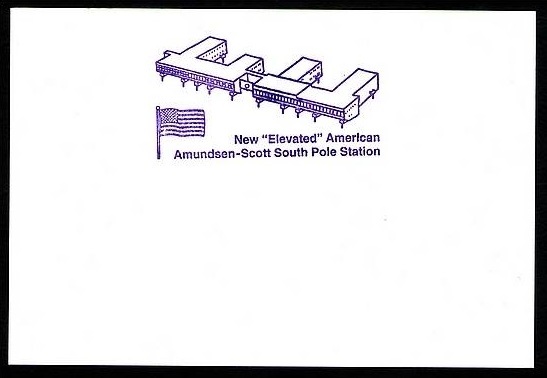 An illustrated First Day Cover sent to the Amundsen-Scott South Pole Station. 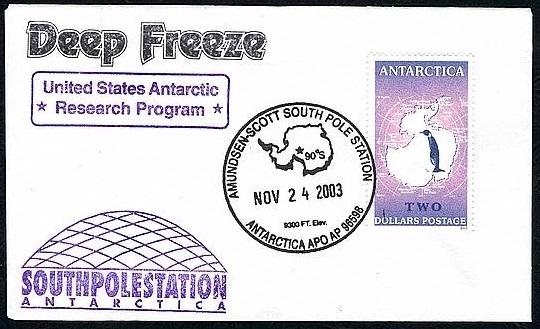 Notice the South Pole Station stamp in purple showing a drawing of the station and the USA Flag. Below this is the South Pole Station cancel 5th November 2002. 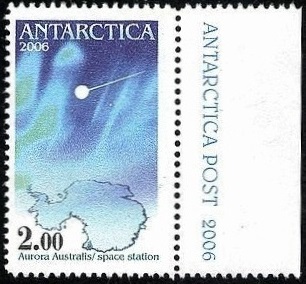 The Antarctica Post stamp was cancelled using an Antarctica Post cancel on 6th November 2002. 2003 Purple Map & Penguin. Date of Issue - 23rd November 2003. 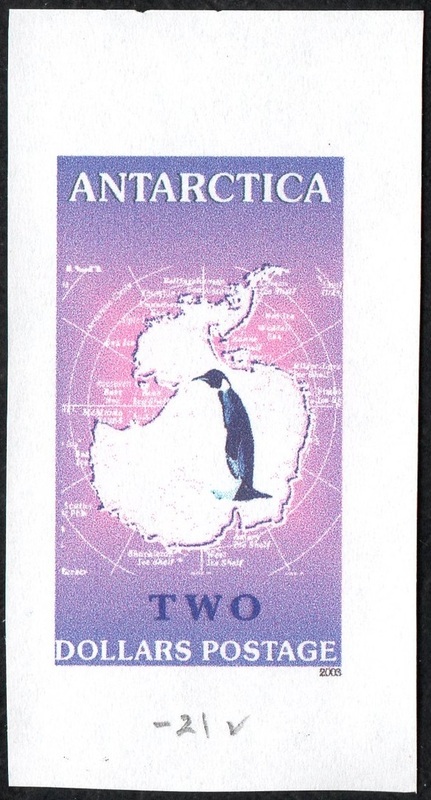 The second issue of Antarctica Post was the stamp known as the "$2 Purple Penguin." Effectively the 2002 design with the value and background colour changed. $2 - 2003 Purple Penguin. 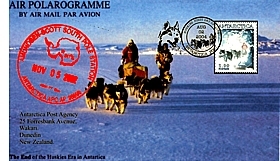 Second Day Cover from the South Pole Station. What I believe is the feature of this cover is that lovely sharp cancel that barely touches the stamp. It's interesting that both this cover above and the block below appear to have been cancelled the day after the official First Day of Issue of the $2 Purple Penguin. Not sure if something went wrong here and they were supposed to have been cancelled on the First Day. 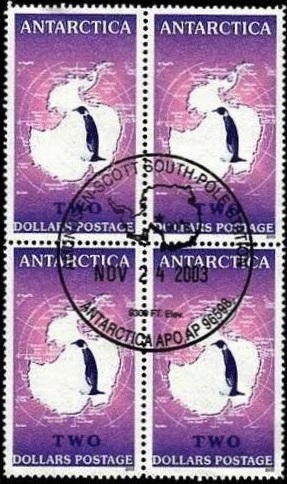 A block of four purple penguins with the full cancel of the South Pole Station. Cover celebrating a solar eclipse over Antartica in 2003. There is a lot on this cover, including are a pair of 2003 purple penguins with postmarks. A map of Antarctica, the "elevated" South Pole Station plus various illustrations of the eclipse. 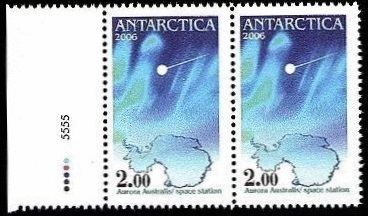 Antarctica Post 2004. Purple Penguin. Colour trial. Colour depth grade on the bottom. The tick indicates this colour depth was selected for the sheet printings. Date of Issue - 19th November 2004. This issue marks the end of the use of huskies to pull sledges in the American Antarctic Program or in the Ross Dependency. The husky teams have been replaced with tractors, snowmobiles and other tracked vehicles. Although it is often said the Huskies enjoyed their work much as farm dogs do, some animal welfare groups complained that having dogs pulling heavy sledges in the snow was cruel so in the end it was decided to end their use. Many of the early Antarctic explorers used dog teams to assist with the pulling of their sledges. The dogs chosen were huskies known for being strong, fast pullers. Huskies are energetic and athletic aminals usually related to wolves. They usually have a thick double coat that can be grey, black, copper red, or white. Their eyes are typically pale blue, although they may also be brown, green, blue, yellow, or heterochromic. The word husky originated from the word referring to Arctic people in general, Eskimos (a.k.a. Inuit), "...known as 'Huskies', a contraction of 'Huskimos', the pronunciation given to the word 'Eskimos' by the English sailors of trading vessels." The use of husky is recorded from 1852 for dogs kept by Inuit people. 2004 Huskies First Day Cover on the left and Post Card on the right. Not sure why these covers were cancelled on Nov 5th when the official issue date is Nov 19th. AP# 5 & AP# 6. Date of issue - 29th November 2005. 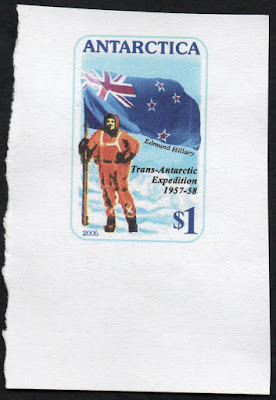 $1.00 - Hillary & NZ Flag. $2.00 - Snocat/Fuchs. $1.00 Hillary & NZ Flag. In keeping with the tradition of polar expeditions of the "heroic age" the CTAE was a private venture, though it was supported by the governments of the United Kingdom, New Zealand, United States, Australia and South Africa, as well as many corporate and individual donations, under the patronage of Queen Elizabeth II. It was headed by British explorer Dr Vivian Fuchs, with New Zealander Sir Edmund Hillary leading the New Zealand Ross Sea Support team. 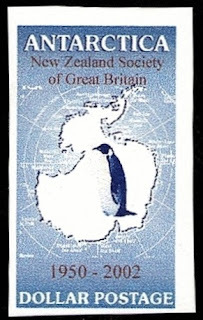 The New Zealand party included scientists participating in International Geophysical Year (IGY) research while the UK IGY team were separately based at Halley Bay. The Tucker Sno-Cat is a tracked vehicle or a family of tracked vehicles for snow conditions, manufactured in Medford, Oregon. Different models have been used for expeditions in the Arctic and the Antarctic during the second half of the 20th century. It differs from other truck-sized snow vehicles, commonly known as snowcats, by its use of four independently mounted sets of tracks. $1.00 Hillary & NZ Flag. imperf proof on piece. Date of Issue - 10th November 2006. $2.00 - Space Station & Aurora. The International Space Station over the southern aurora with the continent of Antarctica below. 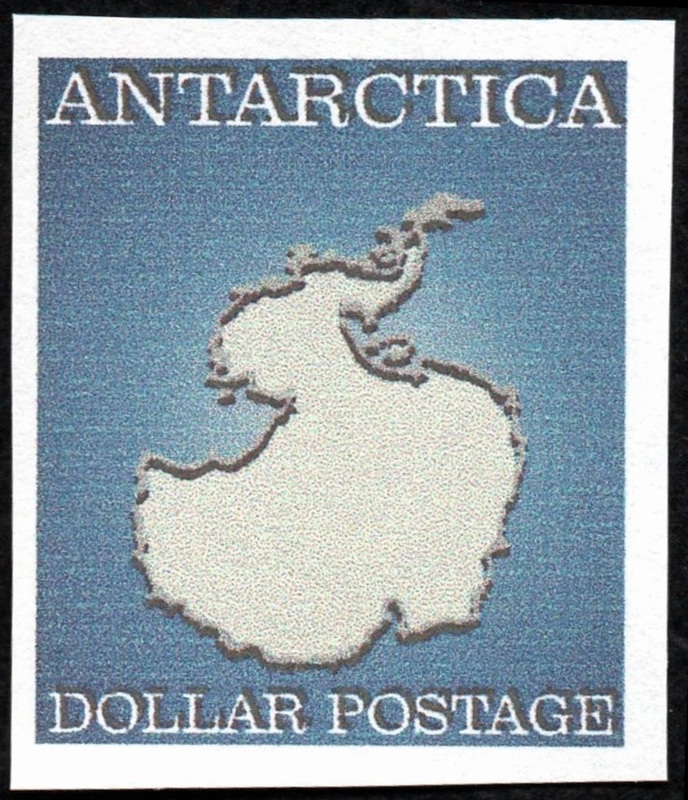 A single example with the selvedge showing "ANTARCTICA POST 2006". Antarctica Post 2006. Aurora and Space Station over Antarctica. Joined pair with sheet number and printer's colour 'lights,' spots used to confirm the various colours used. 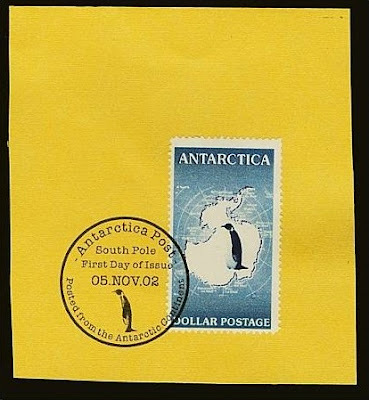 One of the main objectives of Antarctica Post is to send mail to the south pole where it is cancelled before being returned to Antarctica Post in Dunedin in New Zealand. 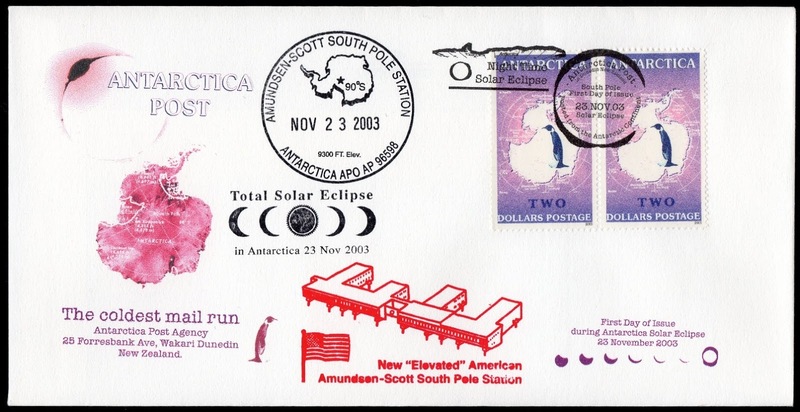 Collectors can then say they have a cover that has been to the South Pole and back. 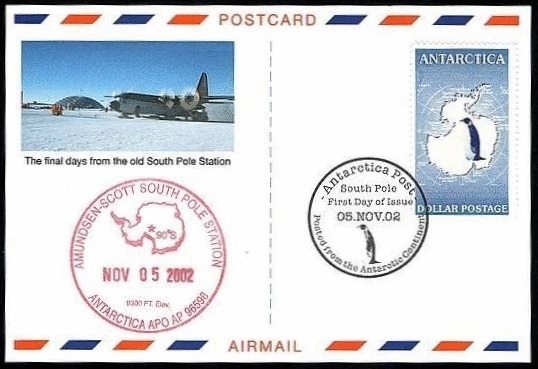 Here is a good example, first being cancelled at South Polar Station on the 1st November 2006 and then cancelled back in New Zealand on the 10th November. 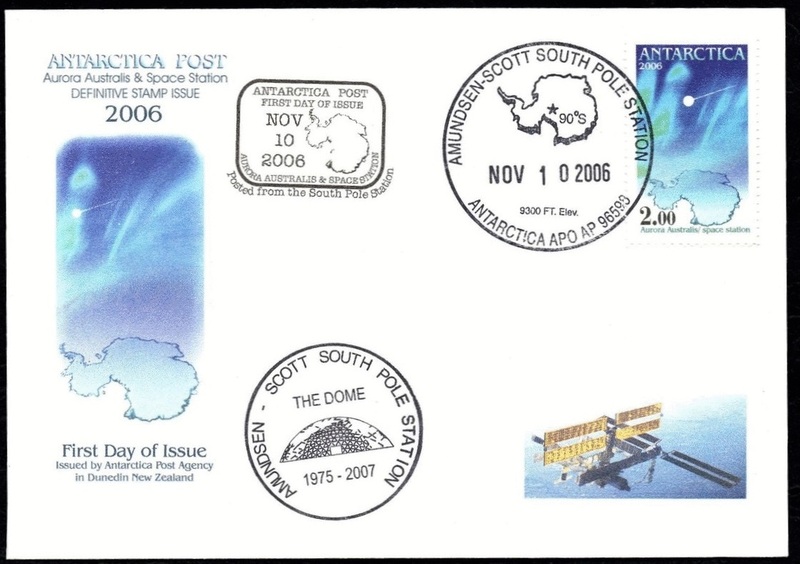 The cover also carries a second South Polar cancel showing the older Dome Station (1975 - 2007). Also included on the cover is a larger image of the one appearing on the stamp and in the bottom right corner, a view of the International Space Station. An interesting printing error where one stamp is only partly printed. 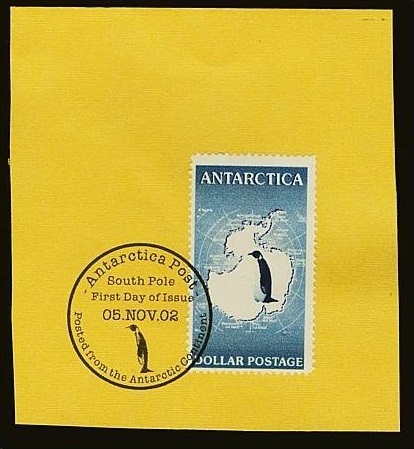 This error must have extended across the whole sheet so there might be more than one of these but since Winepost/Antarctica Post does not disclose much in the way of printing details it is hard to know how wide this sheet actually was. Date of Issue - 29th August 2007. Rear Admiral Richard Evelyn Byrd Jr., USN (October 25, 1888 – March 11, 1957) was an American naval officer who specialized in feats of exploration. He was a recipient of the Medal of Honor, the highest honour for valour given by the United States, and was a pioneering American aviator, polar explorer, and organizer of polar logistics. Aircraft flights in which he served as a navigator and expedition leader crossed the Atlantic Ocean, a segment of the Arctic Ocean, and a segment of the Antarctic Plateau. 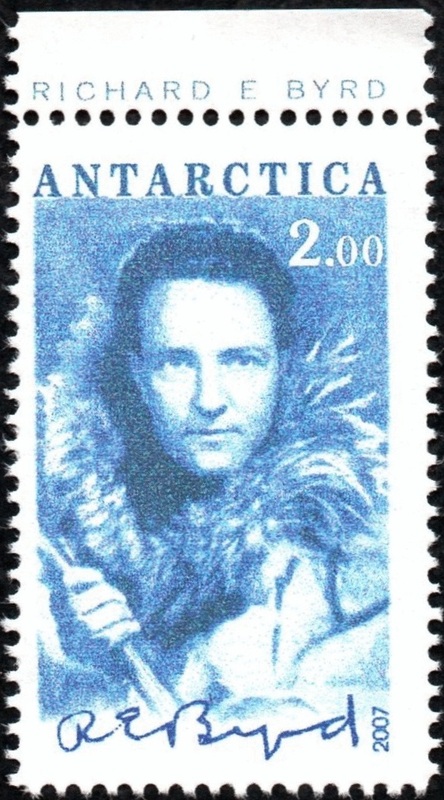 Byrd claimed that his expeditions had been the first to reach both the North Pole and the South Pole by air. However, his claim to have reached the North Pole is disputed. The left-hand stamp is a rare proof with the signature printed in black. On the issued stamp, the right-hand stamp, the signature appeared the same blue colour as the rest of the design. The signature printed with a different colour did not justify the cost of a two colour design and printing. 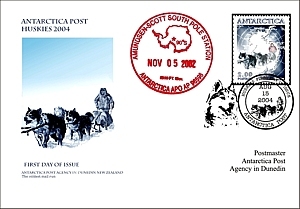 2007 Unique and historical Antarctica Post cover carried on the ice road as it was being made from McMurdo Station to Roald Amundson South Pole Station. 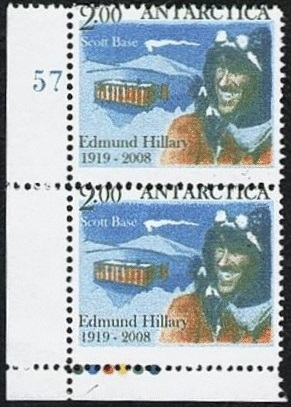 Stamps on this cover span the years 2002-2007 with the stamps being cancelled with various cancels. Date of Issue - 1st May 2008. 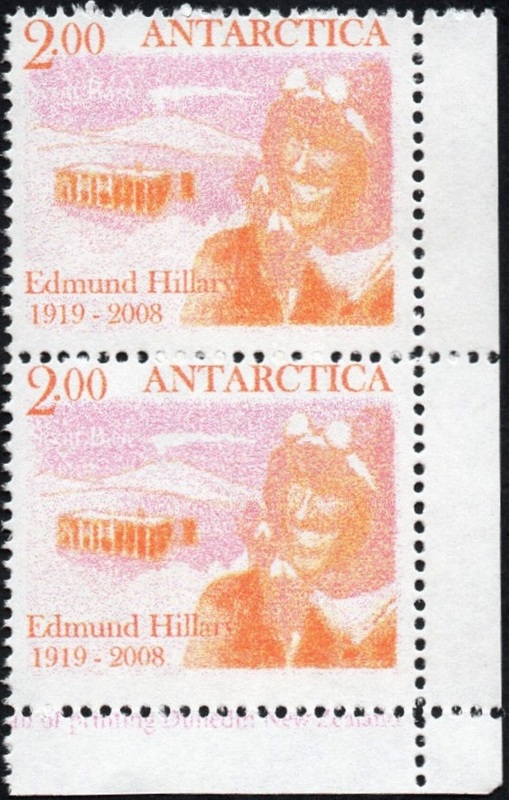 $2.00 - Edmund Hillary in Antarctica. 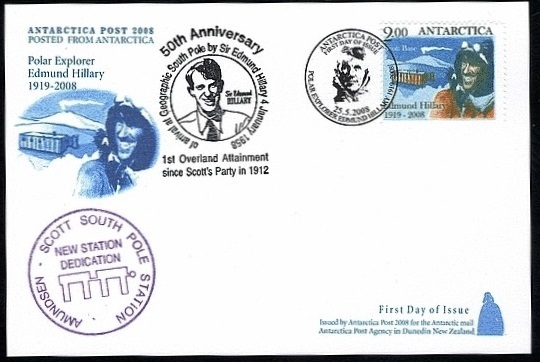 Sir Edmund Percival Hillary KG ONZ KBE (20 July 1919 – 11 January 2008) was a New Zealand mountaineer, explorer, and philanthropist. On 29 May 1953, Hillary and Nepalese Sherpa mountaineer Tenzing Norgay became the first climbers confirmed to have reached the summit of Mount Everest. They were part of the ninth British expedition to Everest, led by John Hunt. Hillary became interested in mountaineering while in secondary school. He made his first major climb in 1939, reaching the summit of Mount Ollivier. He served in the Royal New Zealand Air Force as a navigator during World War II. Prior to the 1953 Everest expedition, Hillary had been part of the British reconnaissance expedition to the mountain in 1951 as well as an unsuccessful attempt to climb Cho Oyu in 1952. 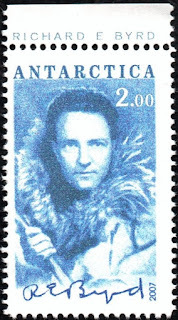 As part of the Commonwealth Trans-Antarctic Expedition, he reached the South Pole overland in 1958. He subsequently reached the North Pole, making him the first person to reach both poles and summit Everest. First Day Cover (card) - 2008 Hillary Issue. 2008 Antarctica Post Hillary-Scott Base printing trial. Here is an interesting error that appears to have been cancelled on the First Day of Issue. The description that came with this item says 'Banding with colours missing' which has produced a similar effect to when your computer printer is running out of ink. There is more to this stamp than you first see. Look at the cancel. New Zealand Wine Post! It's the cancel WinePost used on an issue they did on Hillary at the same time. See the date, where this stamp was issued 1st May 2008 the cancel says FDC 20th June 2008, the date the WinePost stamp was issued. Left-hand Pair: - Perforation shift where the top perf cuts into the title on each stamp. Sheet number 57. Right-hand Pair: - Missing blue colour flaw. Date of Issue - 21st October 2009. $2.00 - Roald Amundsen reaches the South Pole. Roald Engelbregt Gravning Amundsen; 16 July 1872 - 18 June 1928) was a Norwegian explorer of polar regions. As the leader of the Antarctic expedition of 1910–12, which was the first to reach the South Pole, on 14 December 1911, he was a key expedition leader during the Heroic Age of Antarctic Exploration. 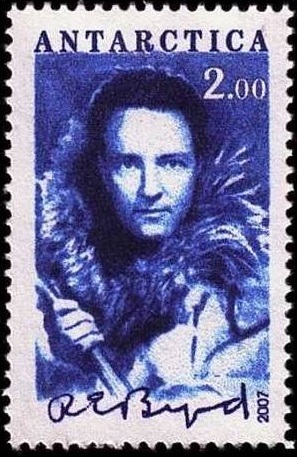 In 1926, he was the first expedition leader for the air expedition to the North Pole, making him the first person, without dispute, to reach both poles. He is also known as having the first expedition to traverse the Northwest Passage (1903–06) in the Arctic. Mary, I found this page from a link in your main Antarctica page. It's something quite different to the usual posts on this blog. Got some good stamps here and interesting information too. I wonder about the use and purpose of these stamps. It appears as if they are aiming at the collector rather than general postage. The idea of owning a cover that had been to the South Pole. Yes Wayne, I agree with you there. 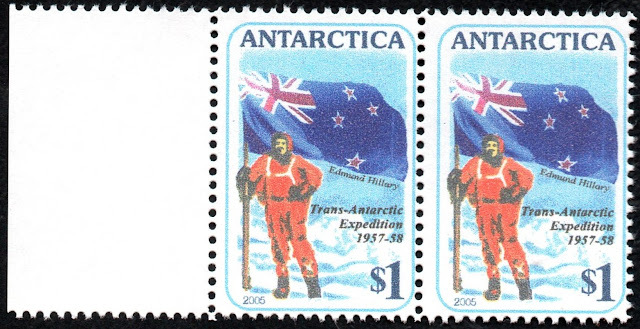 It seems these stamps are used more for collector mail taking a trip to the South Pole and back. But I also agree they are still interesting stamps worth showing on these pages.